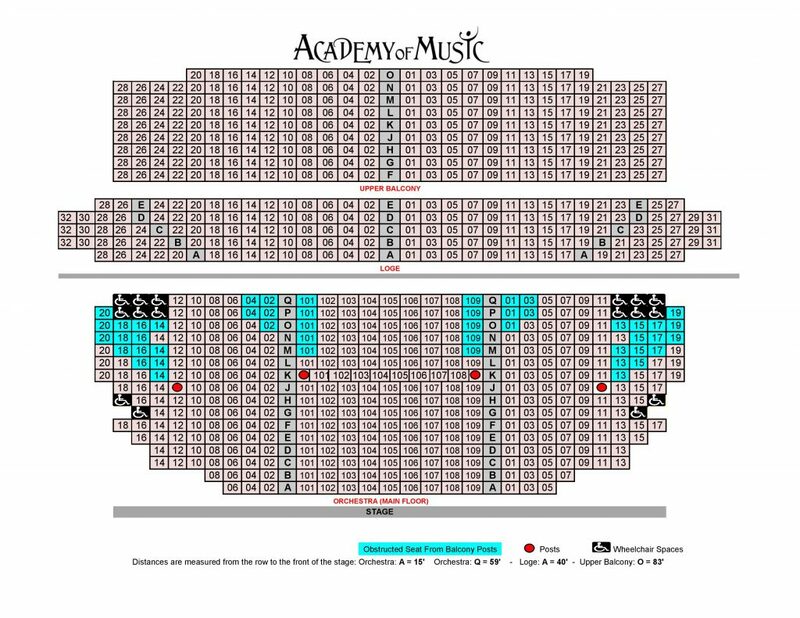 The Academy of Music Theatre seats just over 800, nearly evenly divided between the Orchestra level (main floor) and the Loge and Upper Balcony (balcony levels). Click on the map below to open a large version in a new browser window. Click here for the PDF version of the seating map. ADA accessible seating is located on the Orchestra level, as marked on the map. All Loge and Upper Balcony seating requires taking stairs. We do not have an elevator in our 1891 historic building. Spaces marked with wheelchair symbols on the seating chart are platforms designed to accommodate wheelchairs. They are reserved solely for ADA seating (available online, in person, or by phone) until the rest of the auditorium is sold out, at which point they may become available for general sale. Please note that when those spaces are made available for general sale, seating is in folding chairs. An accessible restroom is available on the main floor of the building, off of the salon to the House Left side of the lobby. Please contact the box office at any time with questions or to alert us to your accessibility needs. We strive to make your visit convenient and comfortable. Contact: boxoffice@aomtheatre.com or 413-584-9032 x105. Our box office hours are Tuesday-Friday 3pm-6pm and one hour before each ticketed performance.